We offer a wide variety of Clevises to meet most any hitching, pulling or towing need. These clevises are high quality and made in the USA by Columbus McKinnon Corp. 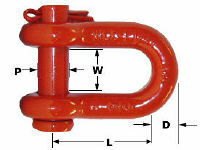 The utility clevis is made from micro alloy steel and supplied with a micro alloy pin. Sizes range from 1/4" through 7/16". The working load limit is from 1,000 to 3,000 lbs. Samples are tested to the minimum breaking strength requirement. These Clevises have a design factor of 5:1. 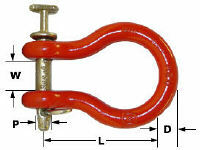 The straight clevis is made from carbon steel and is supplied with an alloy tee handle clevis pin. Sizes range from 3/4" thru 1" with working load limits from 10,000 to 25,000 lbs. 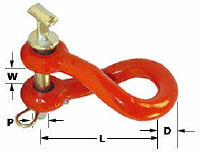 The twist clevis is made of carbon steel and supplied with an alloy tee handle clevis pin. Sizes range from 3/4" thru 1" and the working load limit is from 12,000 to 25,000 lbs. 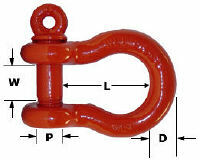 The screw pin clevis is made from micro alloy steel with an alloy pin. Sizes are from 1/4" through 1". Working load limits are from 1,000 to 17,000 lbs. Samples are tested to the Minimum Breaking Strength requirement. The design factor is 5:1. These are for use on multiple hitches where 3 or 4 implements are pulled with one tractor.